When we spotted Michelle Brand’s gorgeous Cascade Chandelier at HauteGREEN this year, we were drawn to the beautiful design like eco-minded moths around a CFL bulb. When we took a closer look and realized that each of the transparent “flowers” in the cascade was actually just the bottom of a plastic drink bottle, we were surprised and impressed. We never imagined that something so simple, cheap and ordinary such as empty water bottles could be turned into a such a stunning and elegant piece of interior design. Brand’s designs extend the aesthetic life of a mass produced object by giving it a second use. Even more, what we really love about “Cascade” is that it highlight’s our throw away culture and the need to provide additional resources for recycling within our cities. Michelle supports the philosophy of slow design, which is the counter balance for today’s fast consumer society. If you’re wondering what happens to the rest of the bottle – Michelle has told us that she has a close working relationship with Emerge Recycling based in East Manchester. The recycled water bottle range consists of lampshades, window screens, room dividers decorative LED indoor lights and cards. Michelle’s award winning designs have been exhibited and commissioned Nationally and Internationally. Recently she has received the Gold Award in the Environmental section of British Female Inventors and Innovators Awards 2007. The COOLest ideas you have here! this really helps me in doing a project for my daughter. thanks for your wonderful idea. Hmmmm...is this a British thing? I don't think my plastic drink bottles have five "petals". When we spotted Michelle Brand's gorgeous Cascade Chandelier at HauteGREEN this year, we were drawn to the beautiful design like eco-minded moths around a CFL bulb. 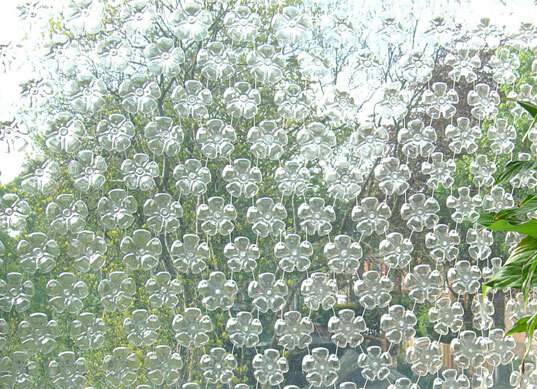 When we took a closer look and realized that each of the transparent "flowers" in the cascade was actually just the bottom of a plastic drink bottle, we were surprised and impressed. 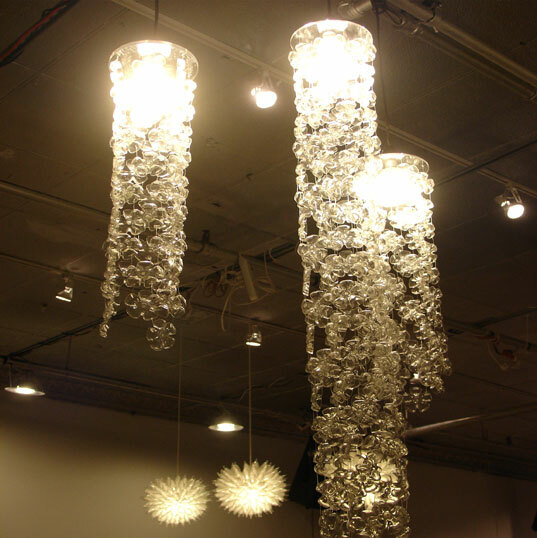 We never imagined that something so simple, cheap and ordinary such as empty water bottles could be turned into a such a stunning and elegant piece of interior design.